What is significant?The former Robyn Boyd House was built in two phases by the noted architect and writer, Robyn Boyd. The building was originally located on the bank of a former creek. This creek, which ran along the eastern half of the site, had been converted to an open horse-shoe drain and was subsequently enclosed and covered with fill. Building was thus restricted to the western half of the site. The first stage was designed in 1946 and was completed in the following year. It is the first house built which Boyd designed himself. The second stage was designed in 1951 after Boyd had returned from his first overseas trip to Europe (made possible by winning the Haddon Scholarship) and completed in 1952. The 1947 section is in sound condition and retains much of its original fabric. It has a low-pitched gable roof covered with bituminous felt and embedded with white gravel. A layer of solomit (packed straw) below provided a layer of insulation. This roof failed and it was later covered in metal tray deck. The walls are of bagged brick and the floor is partly reinforced concrete and partly timber. The most striking feature of this building is the long outwardly canted glazed wall on the east elevation. The modest sized home was entered through the carport, which was extended to the east as a pergola. On entering the house, a view is gained of the open planned interior before descending a stair to the living/dining/ kitchen and former bedroom area. Variation in the floor and ceiling heights, and the use of joinery (timber cupboards with large disk handles) and screens divided the large space into respective zones. Caneite was used on the ceiling, oregon boards and bagged brick were the wall finishes, and cork tiles and polished timber boards were used on the floors. With the 1952 additions (north and south of the original building), the house was enlarged considerably. The northern section is currently in poor condition but both sections have undergone modification. A bedroom was added to the south, and to the north was added a living area, bedroom and small bathroom. The interior of the northern section was sleekly fitted out; the ceiling was of woven plywood with flush light fittings, the two long brick walls (west and east) were painted silver black and cream, and black semtex vinyl tiles were used on the floor. A central copper fireplace provided a focus to the living room. 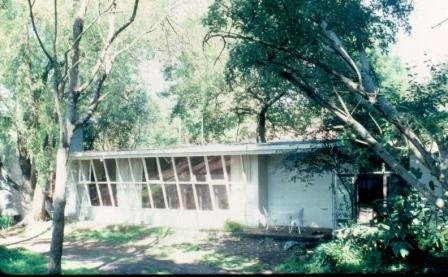 The house was further extended to the south by the Rajendrans in 1975 with a two-storey structure and as a result alterations were made to Boyd's 1952 southern addition, which has altered the legibility of the original design. The roof of the 1952 section of the building was reconstructed in 2004. How is it significant? The former Robyn Boyd House is of social, historical and architectural significance to the state of Victoria. Why is significant?The former Robyn Boyd House offers a rare insight into the development of the architectural ideas of Robyn Boyd during the early style forming part of his career from 1947 to 1952 on the one site from the Victorian Type (defined in 'Victoria Modern' of the same year) to an individual interpretation of the International Style. The elongated form of the building of the building was dictated by the constraints of the site. The planning was unusually open compared to many contemporary houses, with variations in floor and ceiling heights, and cupboards and screens dividing large spaces into zones, with different functions. There are several points of interest about this building such as the early use of some of the internal finishes, and the long outwardly canted glass wall. The post-war shortages of materials created a climate conducive to experimentation and Boyd took up the challenge forced on architects by the practical reality. Several materials were used in novel ways for example, solomite (packed straw usually used for fencing) was employed in both sections of the house as an insulating roof material. The floor of the northern part of the 1952 additions was an early domestic example of a reinforced concrete raft slab. The house is significant for its association with Boyd. As an architect, he was well recognised throughout his career for the rigour and distinctiveness he brought to most of his design work. Through his teaching and writings, both in the daily newspapers and scholarly journals (local and international), he had wide influence on both architects and the general public. He was instrumental in bringing the discussion of Modernist architectural concerns into the marketplace, particularly in Melbourne. The upshot was that the design (including planning, use of materials and architectural expression) of many suburban houses altered dramatically from the mid-1950s onwards. Robin Boyd was also a member of the notable Boyd family, who have been well recognised for their artistic and literary endeavours.